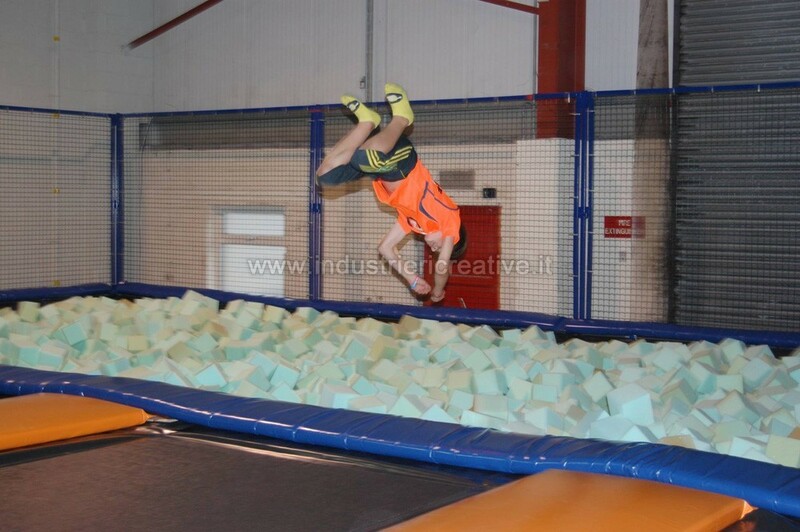 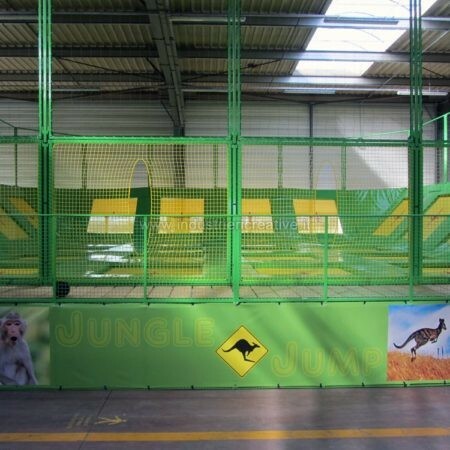 Thanks to our 35-years experience during which we have manufactured and installed thousands of pro-level trampolines all over the world, for some years now we have been designing, manufacturing and installing customized trampoline parks in the most varied types for playing environments, very different in size, colour and design. 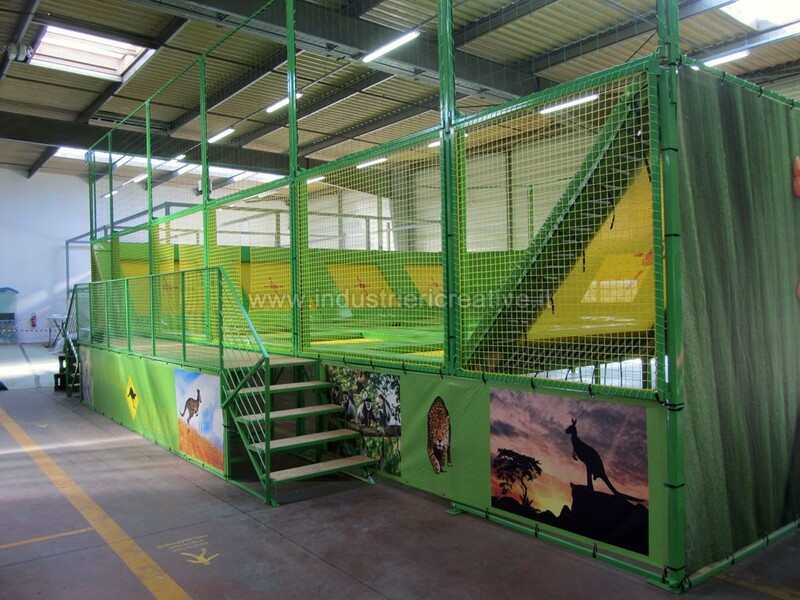 The solidity of load-bearing structures, fireproof and non-toxic tissues for cushions and professional hand-woven mats are the most appreciated aspects of our production. 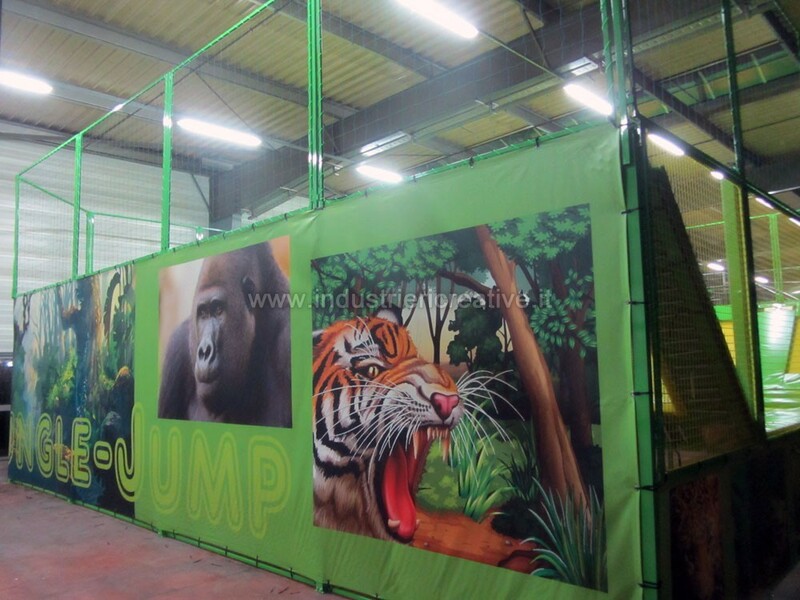 Great importance is given to personalised designs, applied by spray gun by one of our artists or digitally printed. 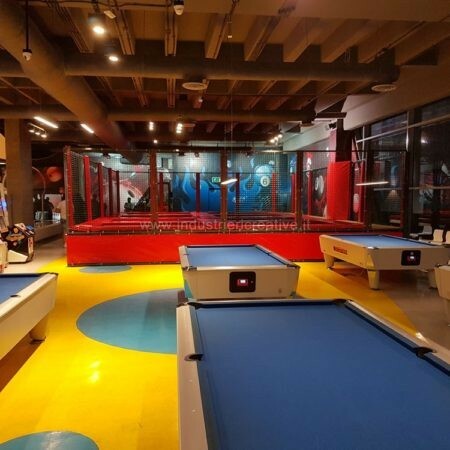 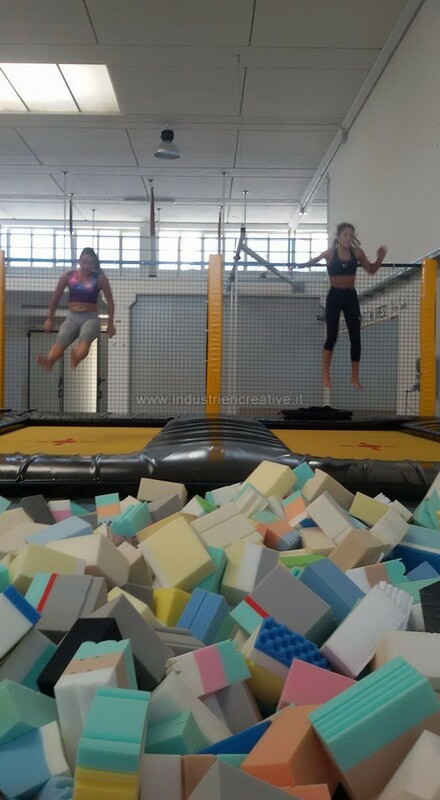 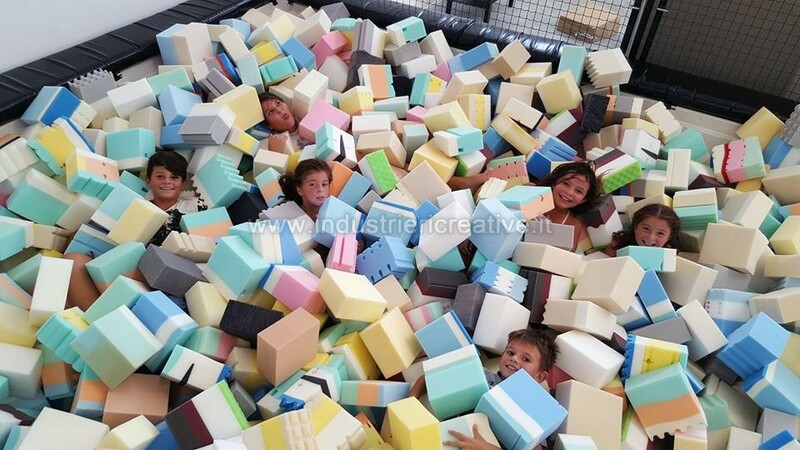 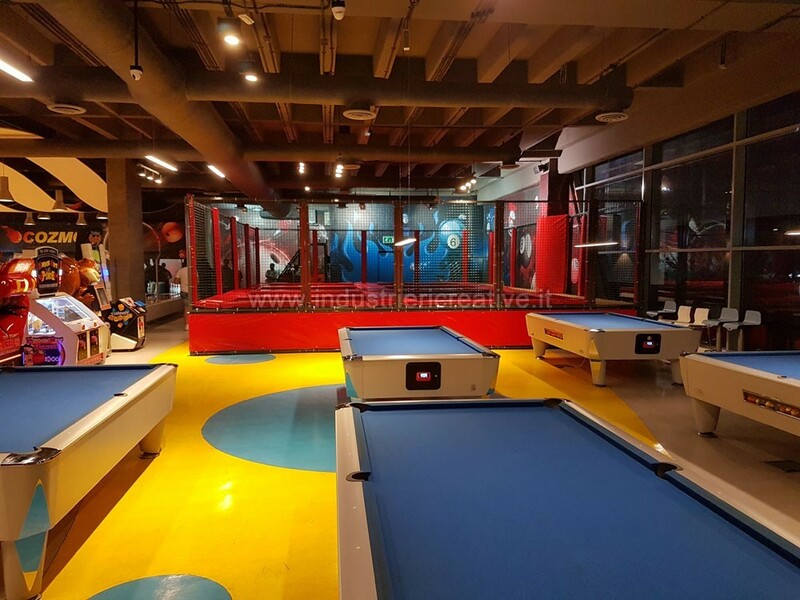 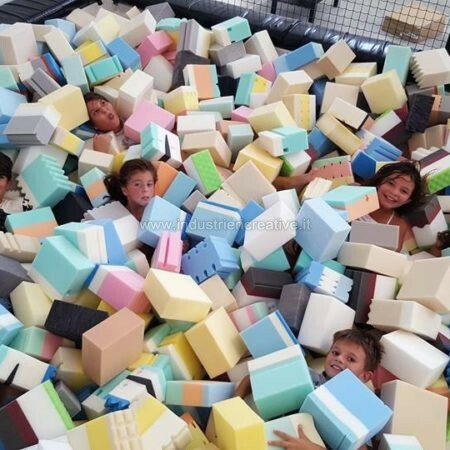 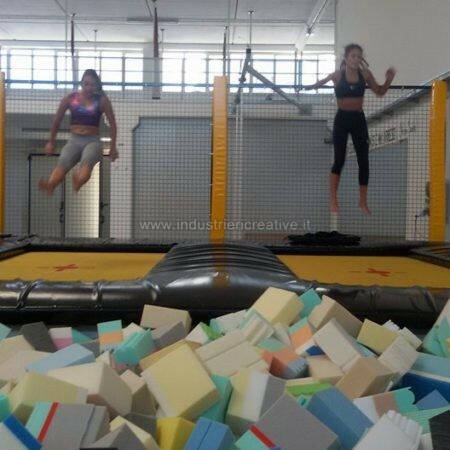 The playing area is composed of a series of two or more aligned trampolines on which users jump and move forward, ending their route with an amazing dip in a large container filled with thousands of soft sponge cubes or, alternatively, on a large and soft inflatable Airbag. 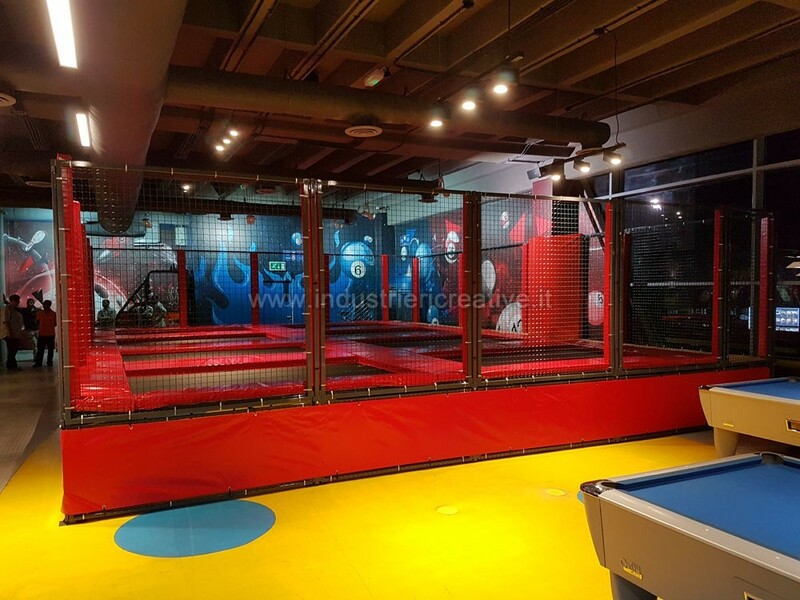 The playing area consists of a series of interconnecting and different-sized trampolines. 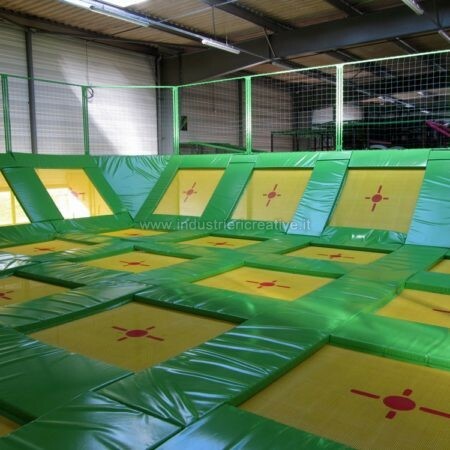 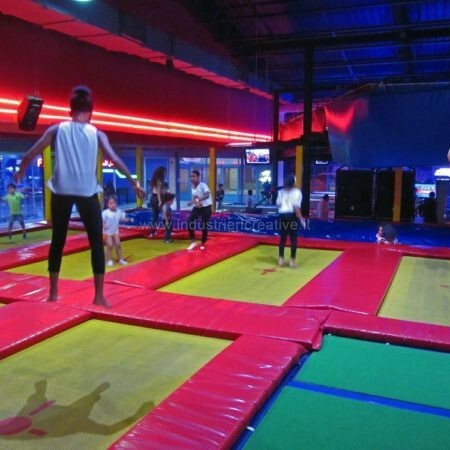 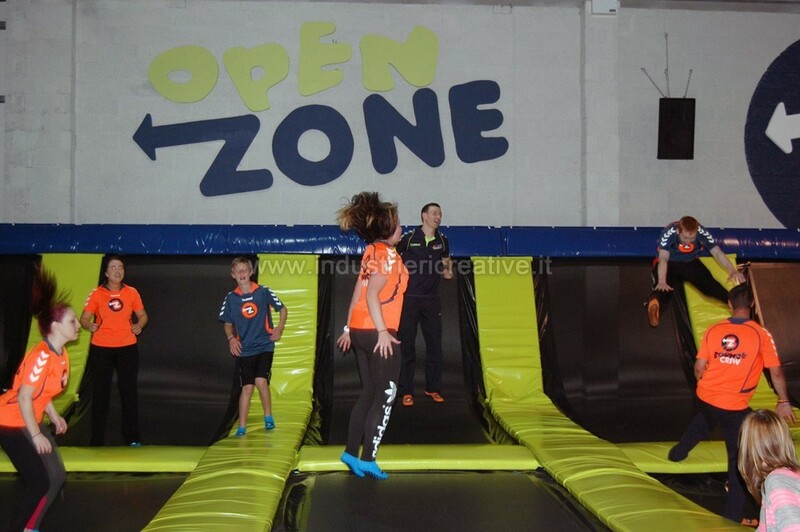 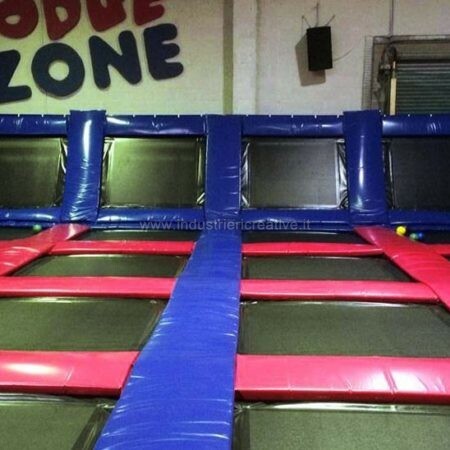 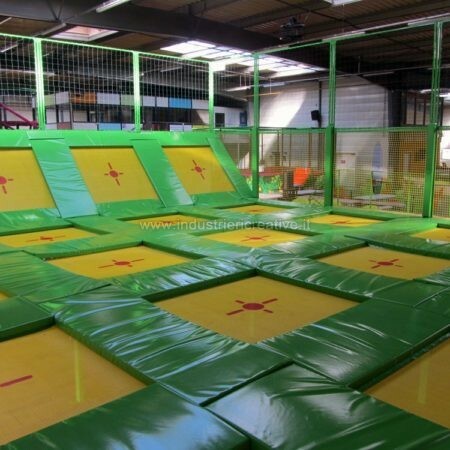 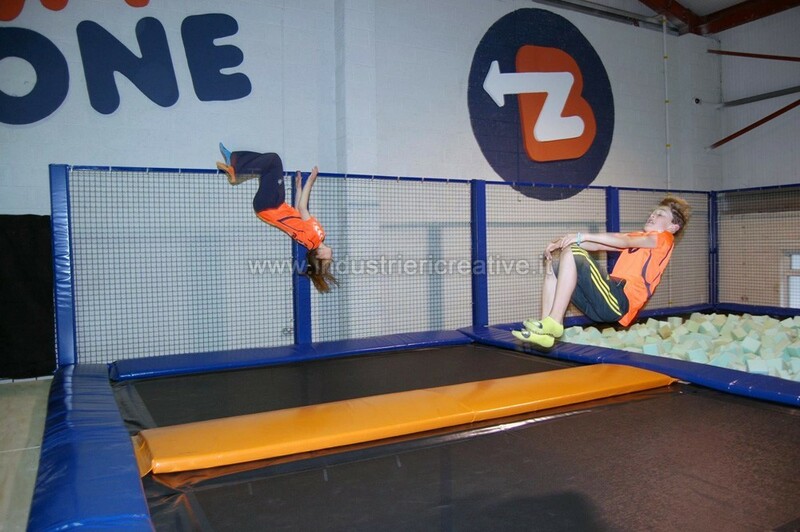 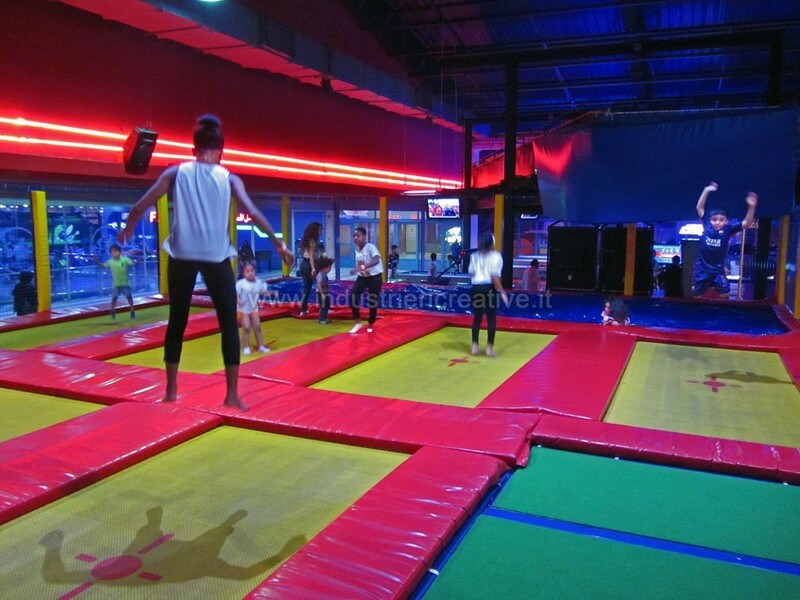 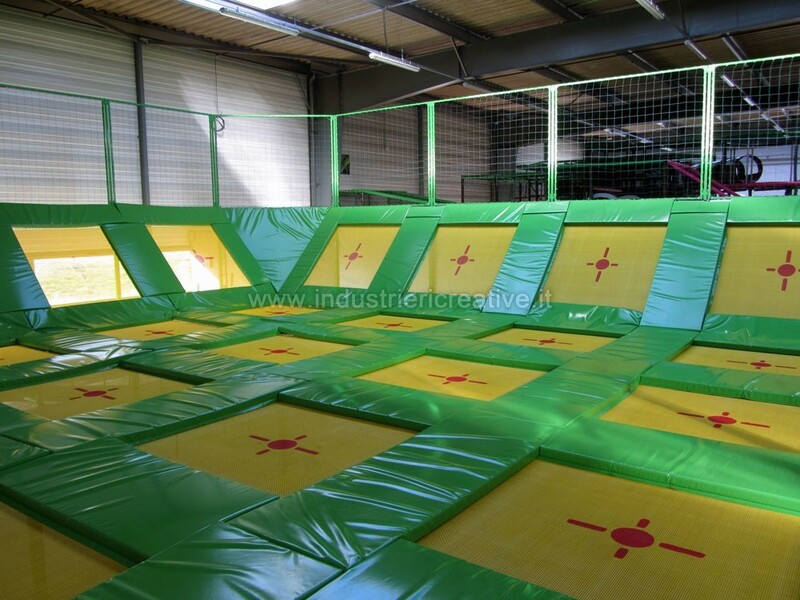 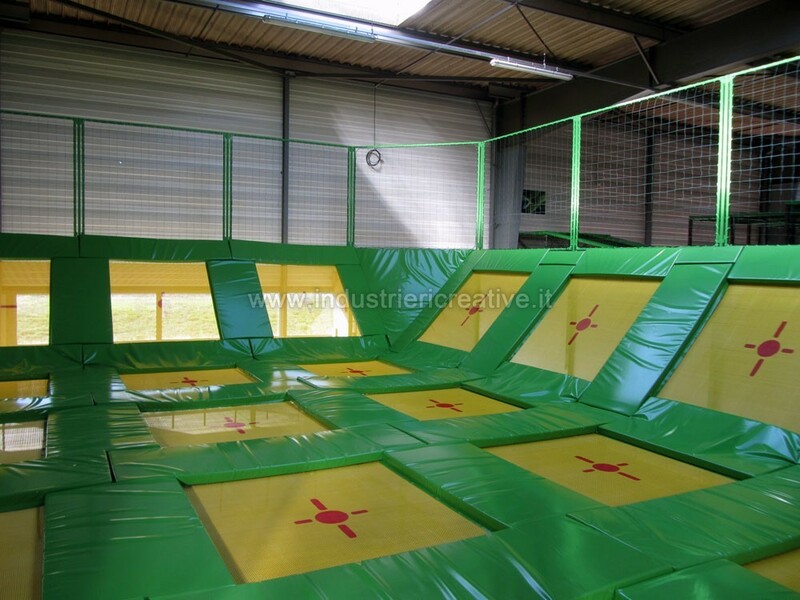 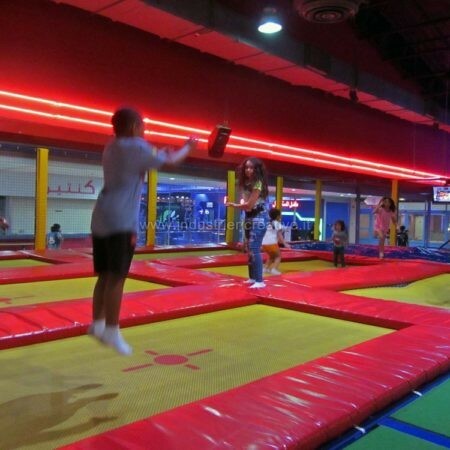 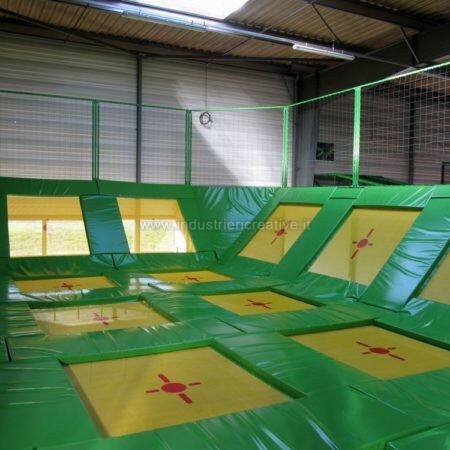 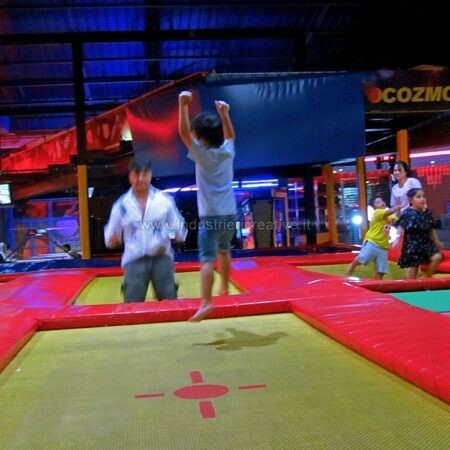 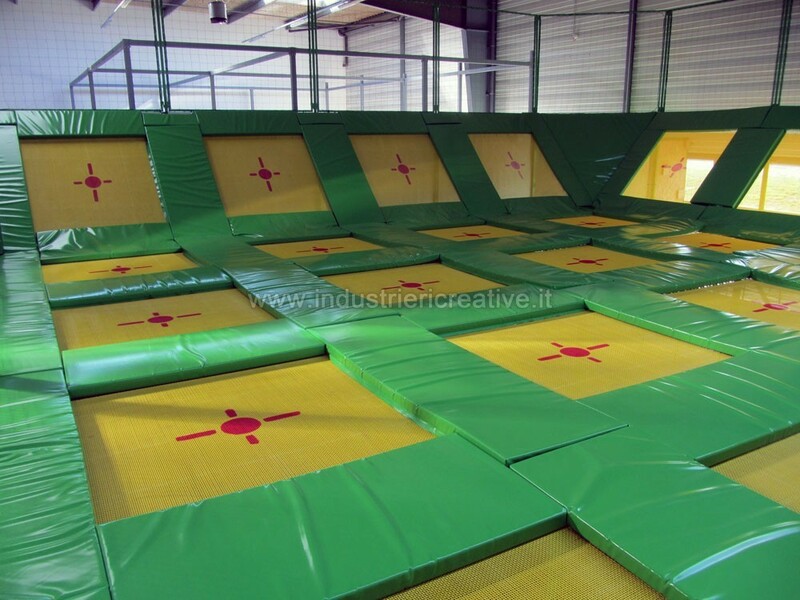 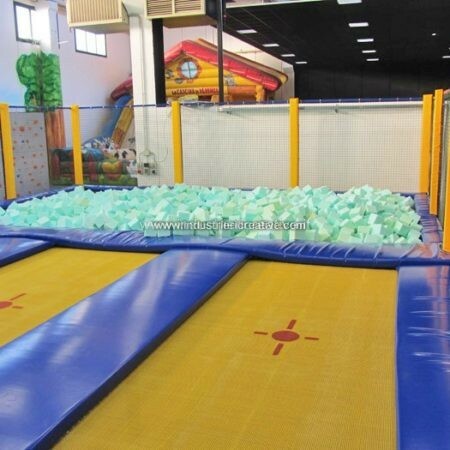 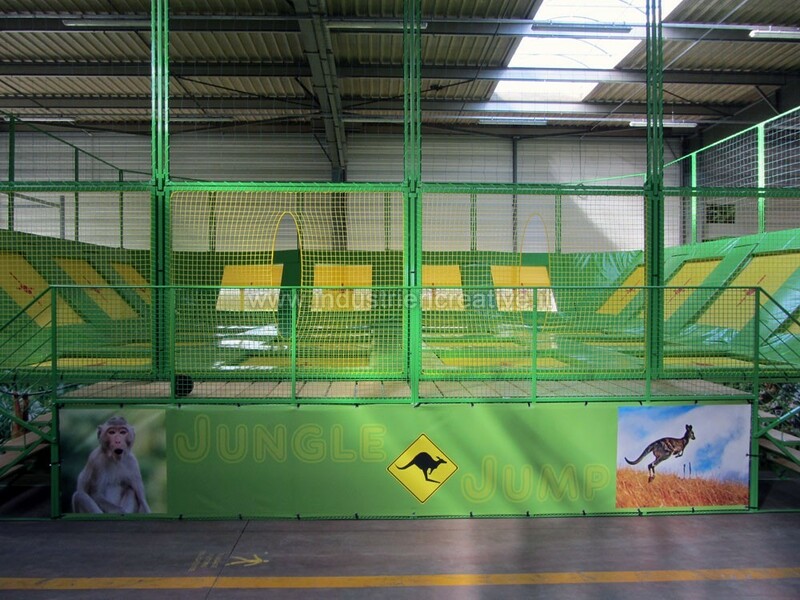 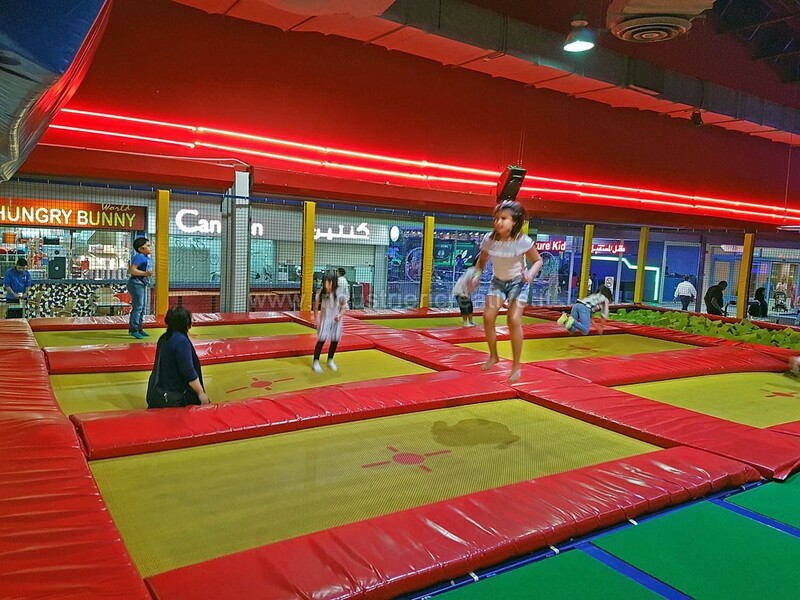 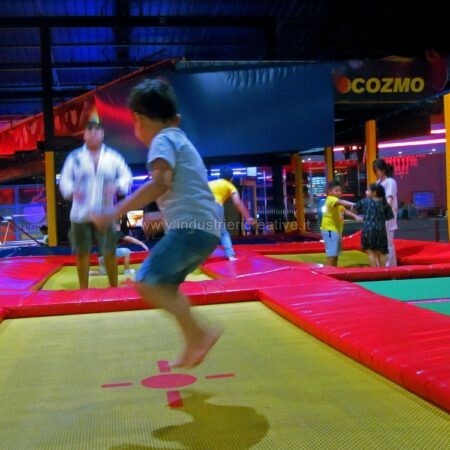 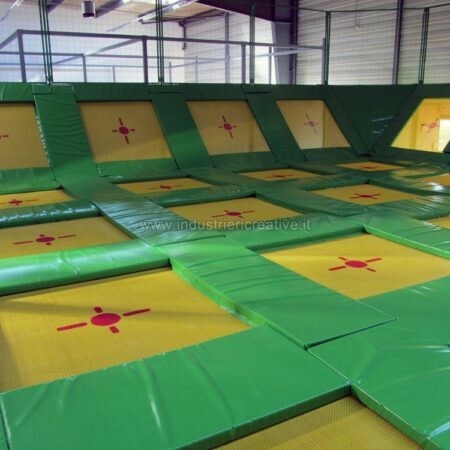 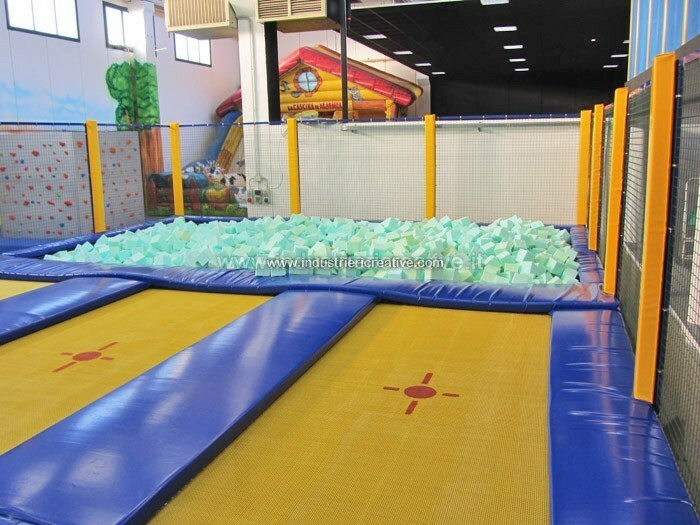 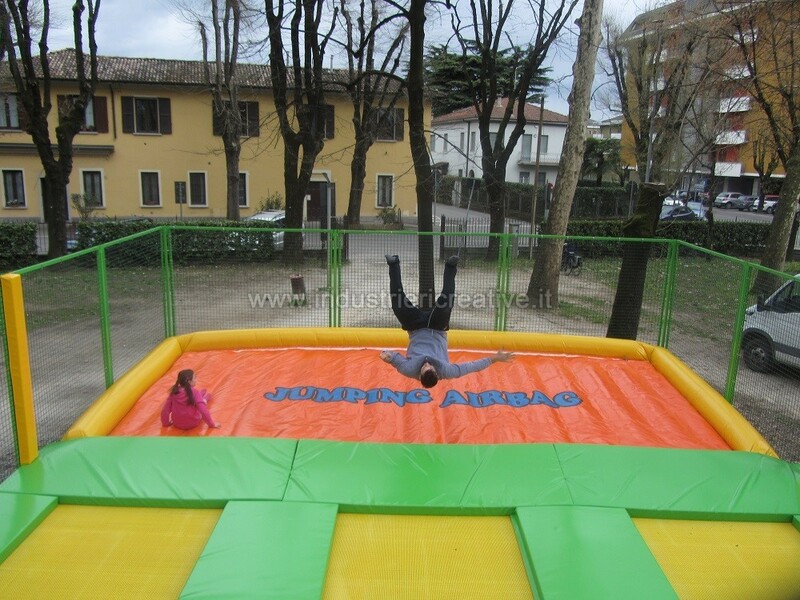 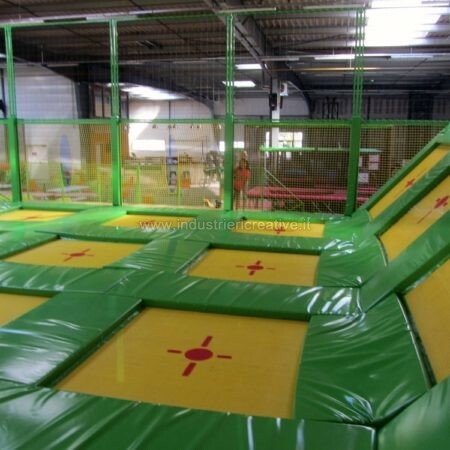 Users can give vent to their exuberance jumping from one trampoline to another, bouncing on the vertical walls also equipped with trampolines and competing with their friends in fun rides and amazing jumps! 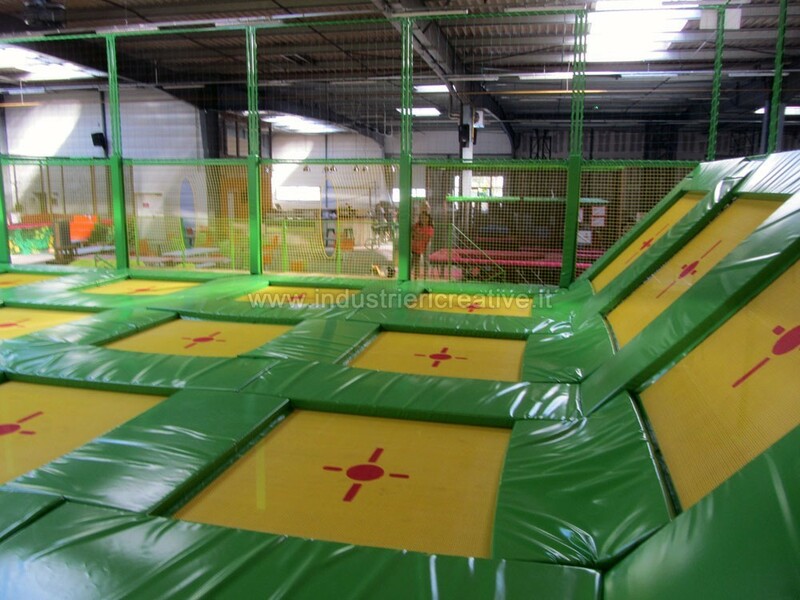 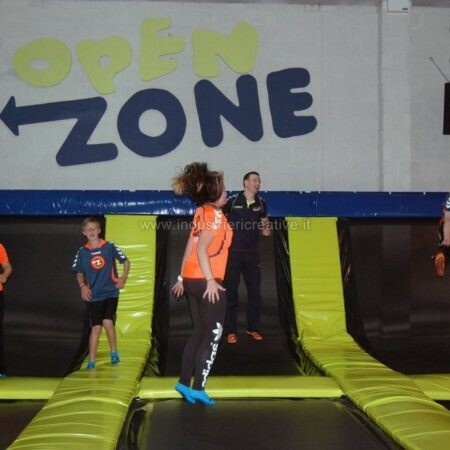 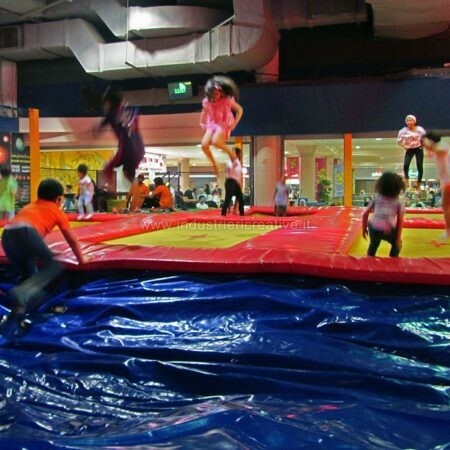 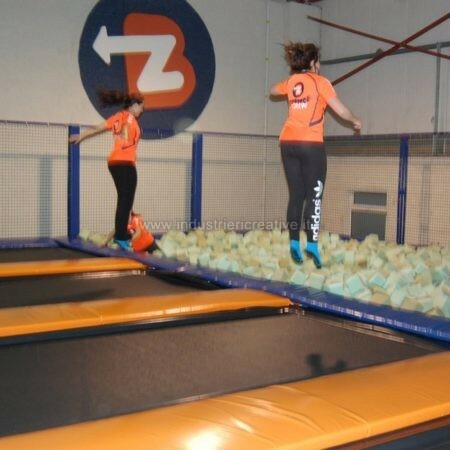 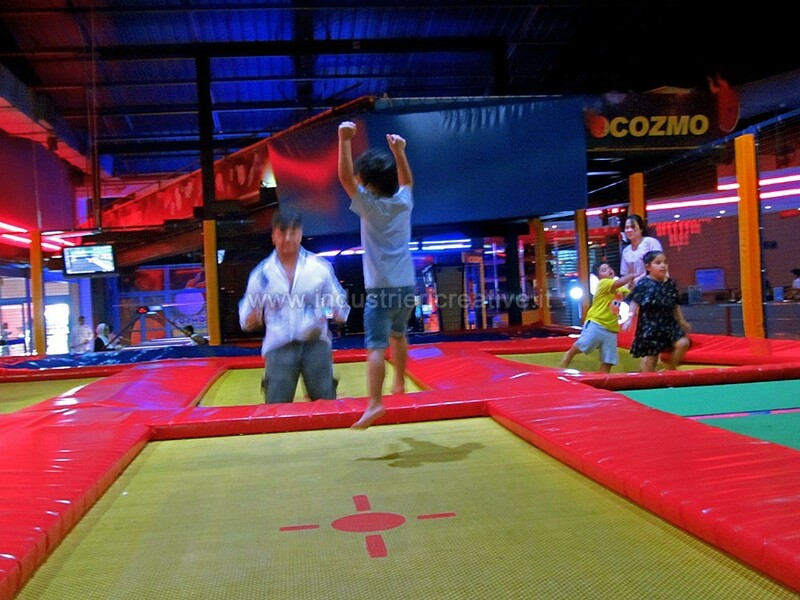 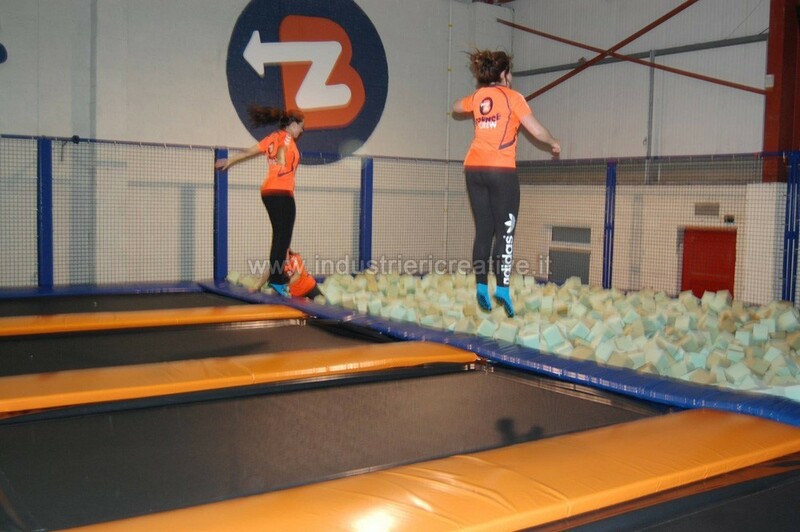 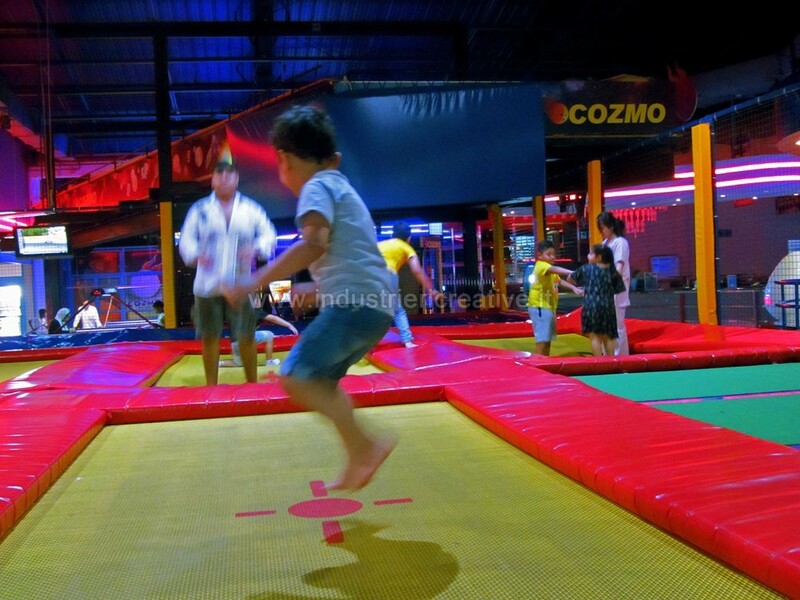 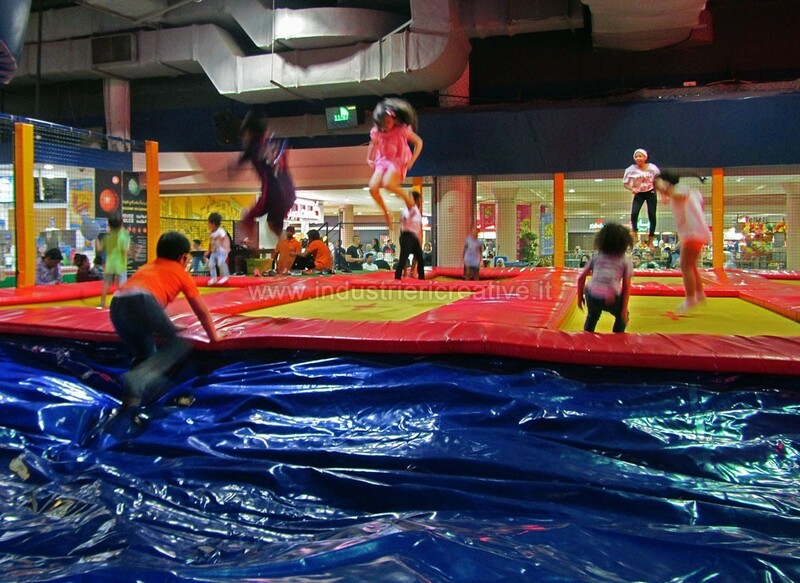 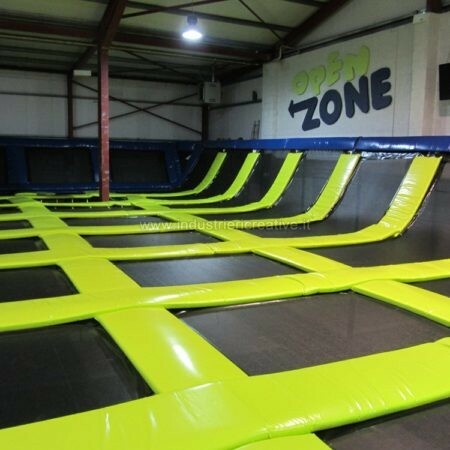 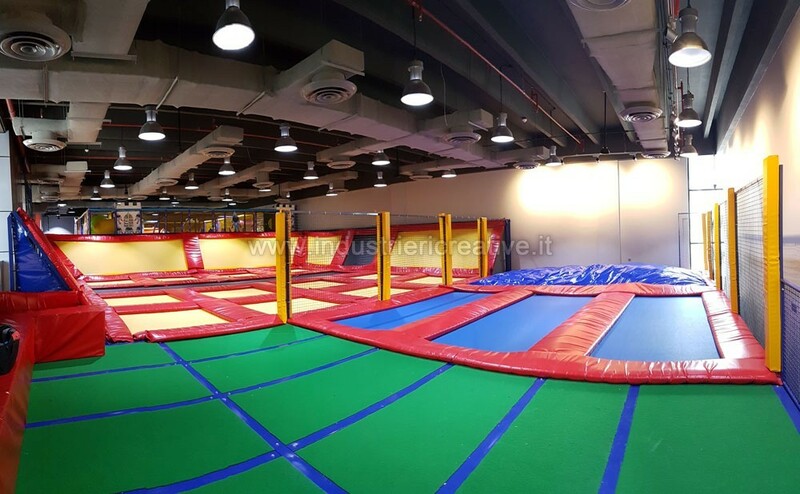 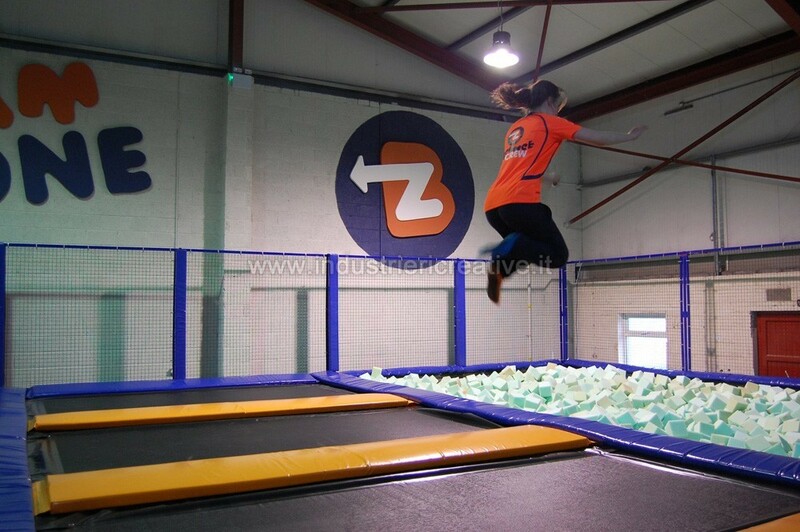 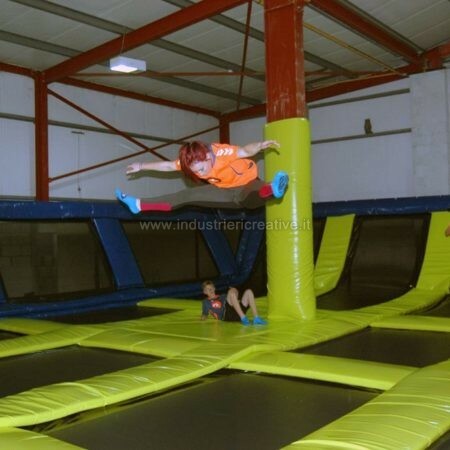 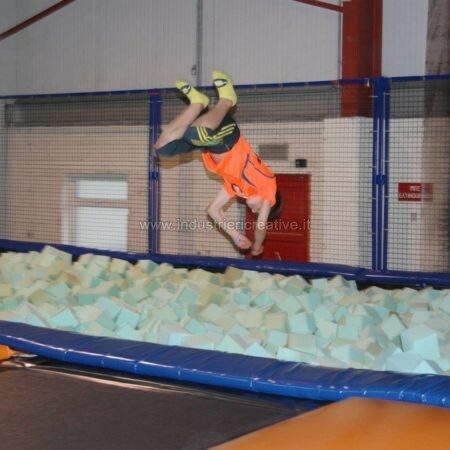 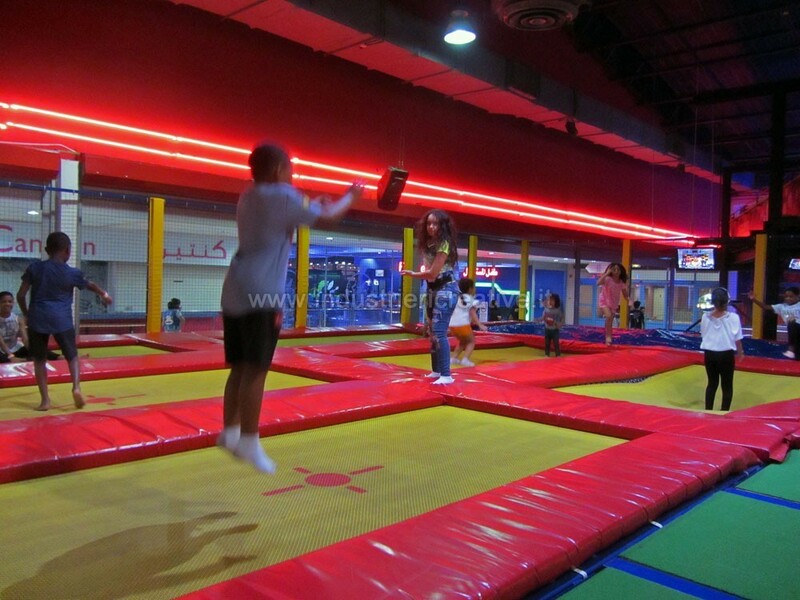 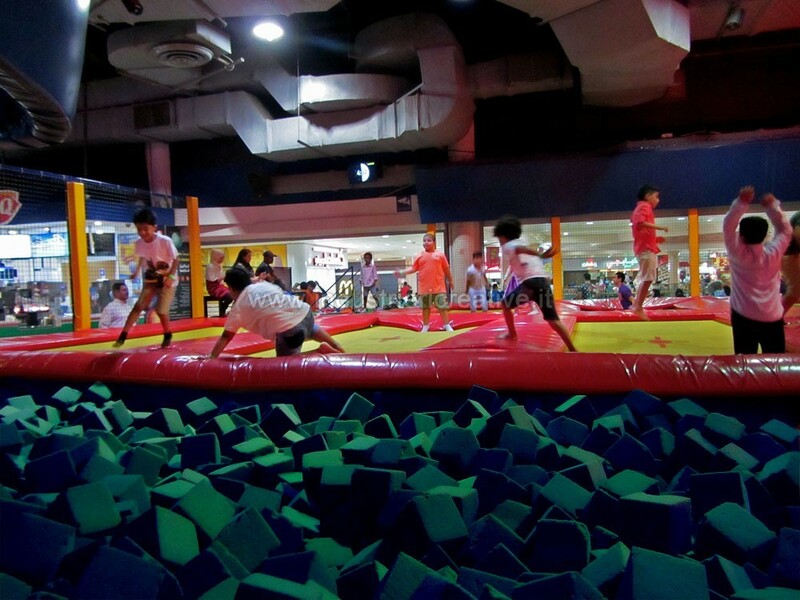 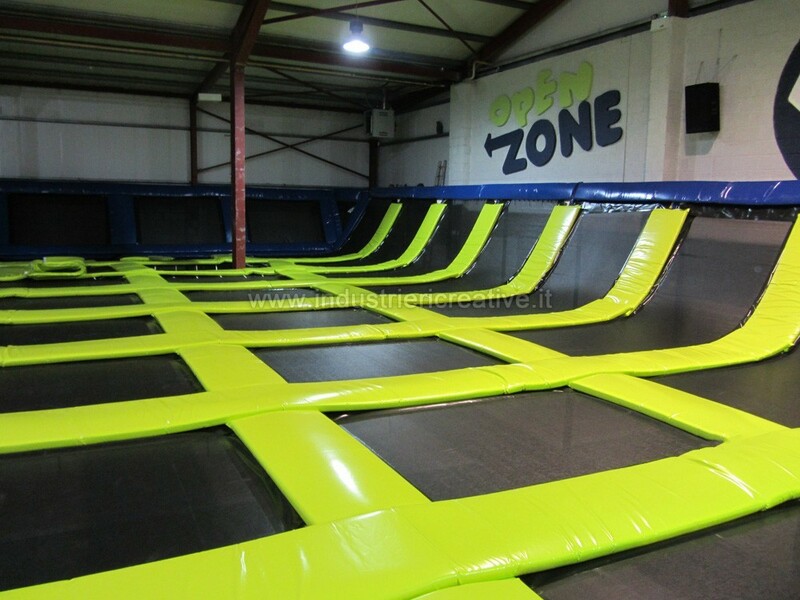 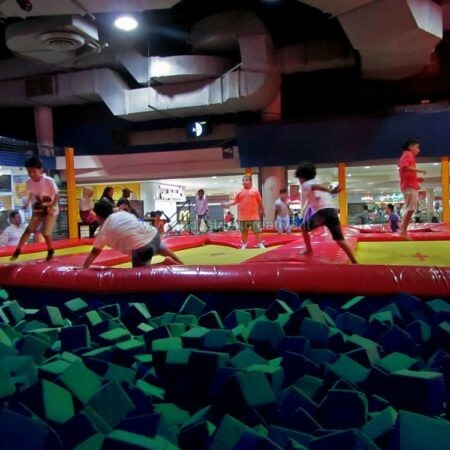 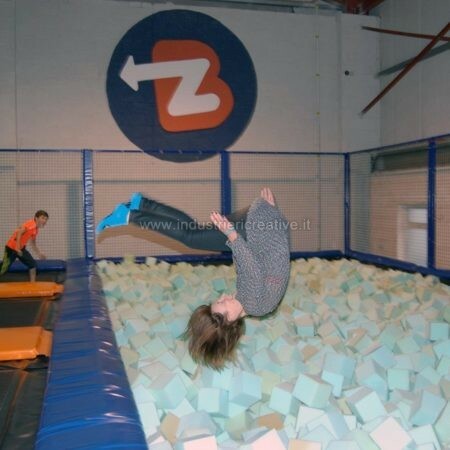 The area can also be equipped with very long Runway trampolines that allow, jump after jump, to reach the Foam Pit or the above-mentioned inflatable Airbag. 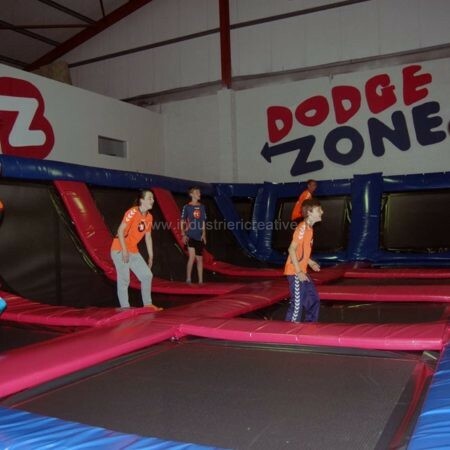 The area is big enough to allow two teams to play a similar-to-dodgeball match: users can jump and fly in the air, play with the ball and try to hit the opponents so as to eliminate them. 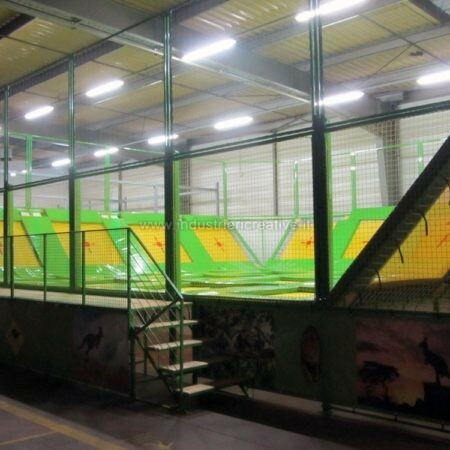 The perimeter of the structure is made of vertical trampolines, on top of which there are mesh panels to keep the ball in. 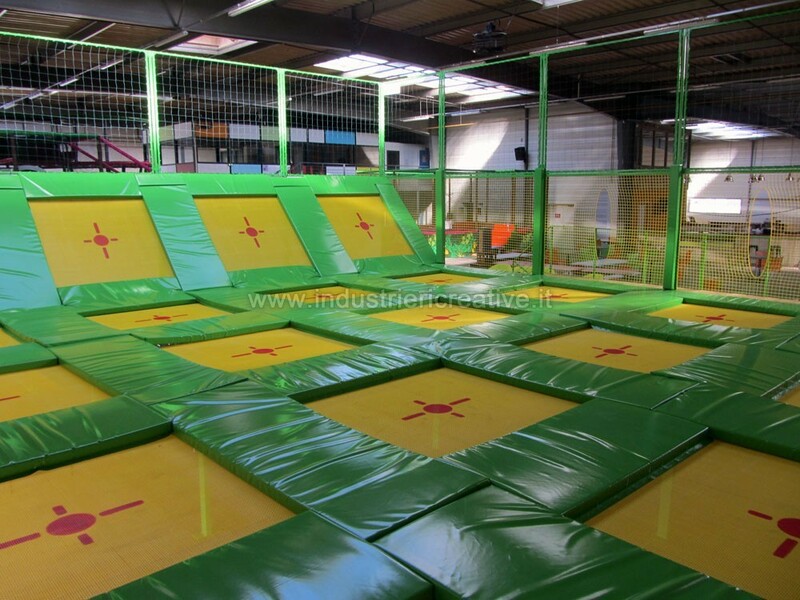 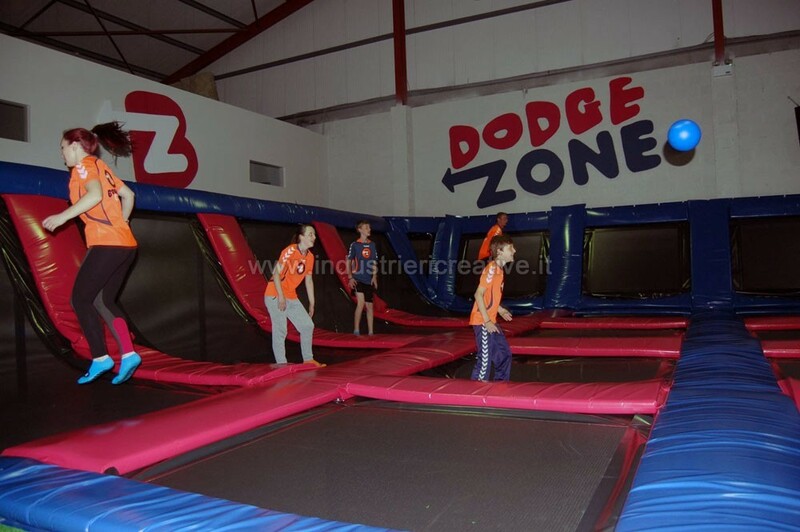 It is mainly intended for playing dodgeball, but it can also be used as a mini Free Jump Area. 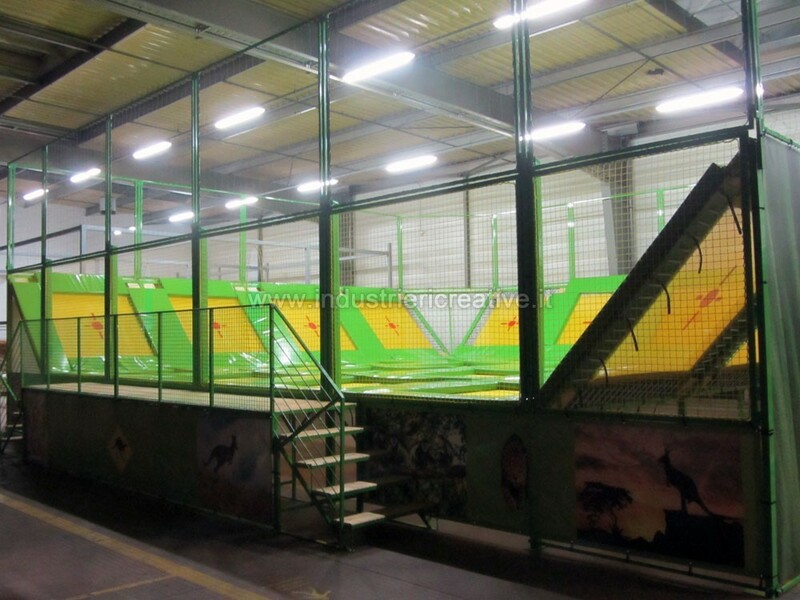 Basketball is a play equipment made of trampolines on which, always jumping, you will play basketball! 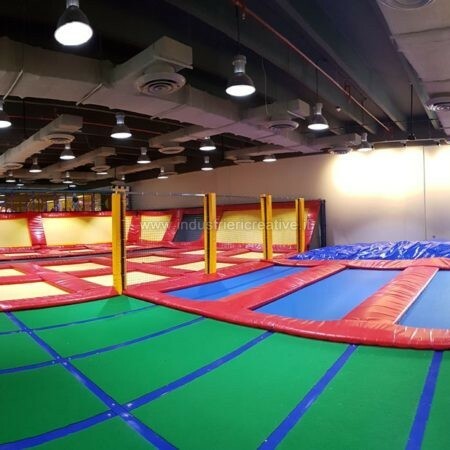 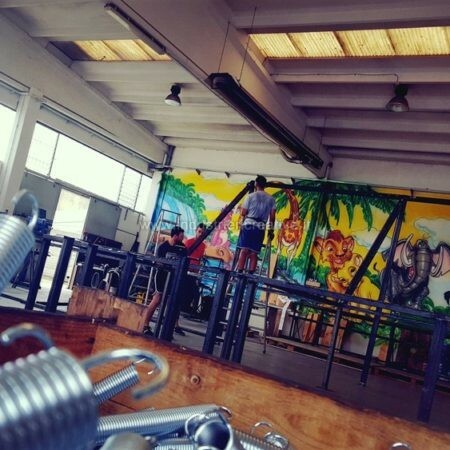 Installing a trampoline park requires a minimum area of 600-700 m² also taking into account the space dedicated to the public; for indoor use, the minimum room height is 6 meters. 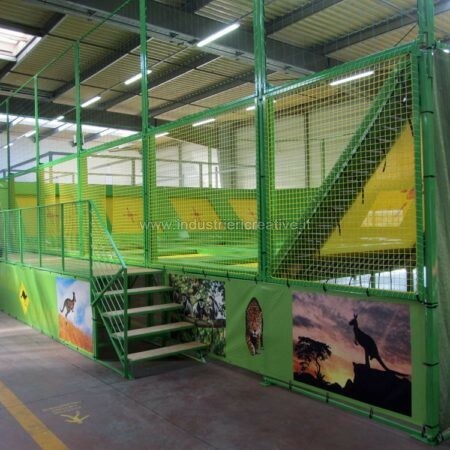 This impressive play equipment has a great appeal to the public! 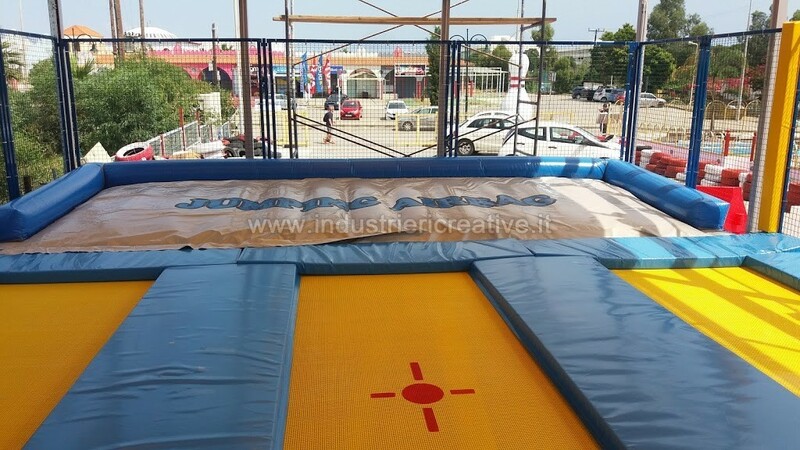 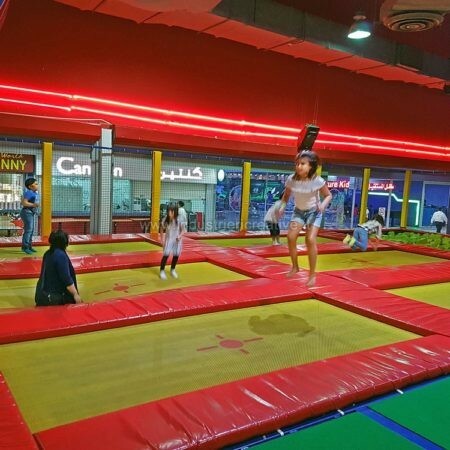 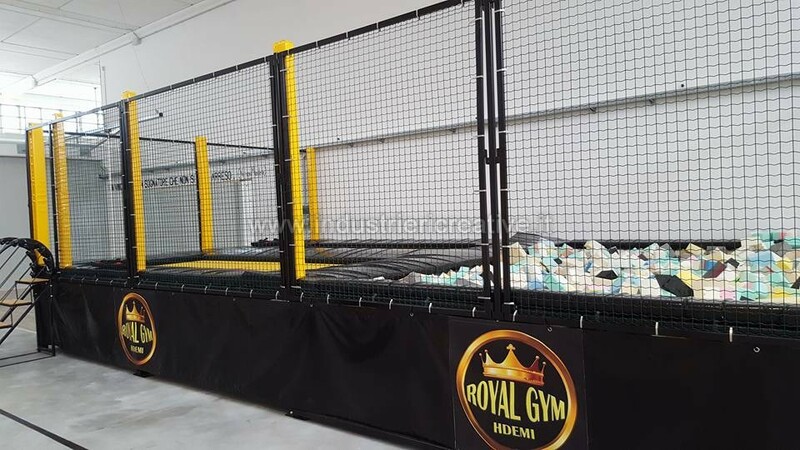 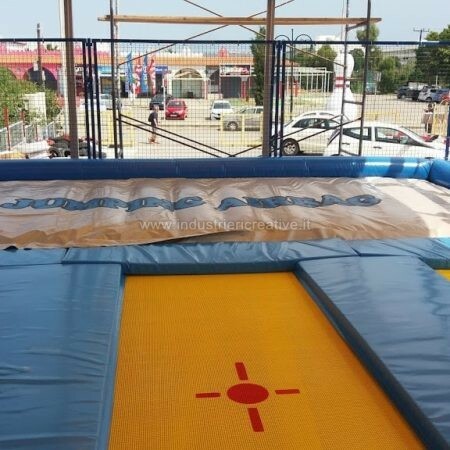 We also supply outdoor Trampoline Park’s models to be installed in tourist resorts: they are very popular and allow the customers to achieve excellent economic results. 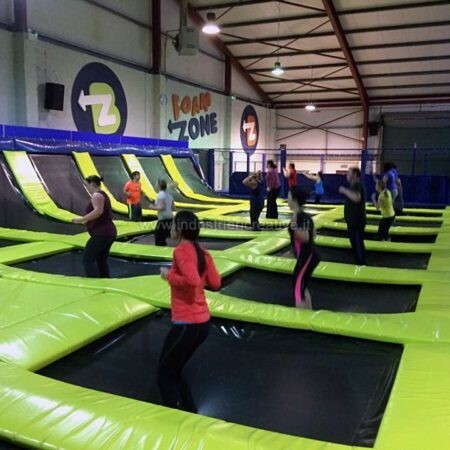 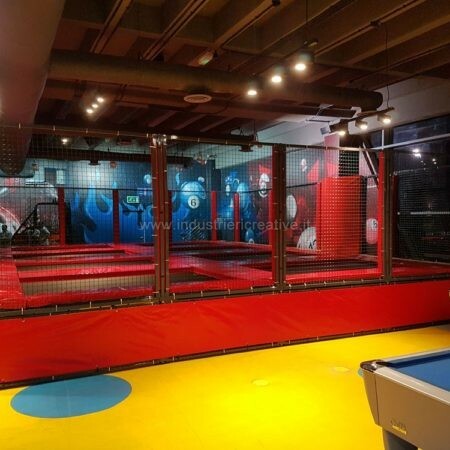 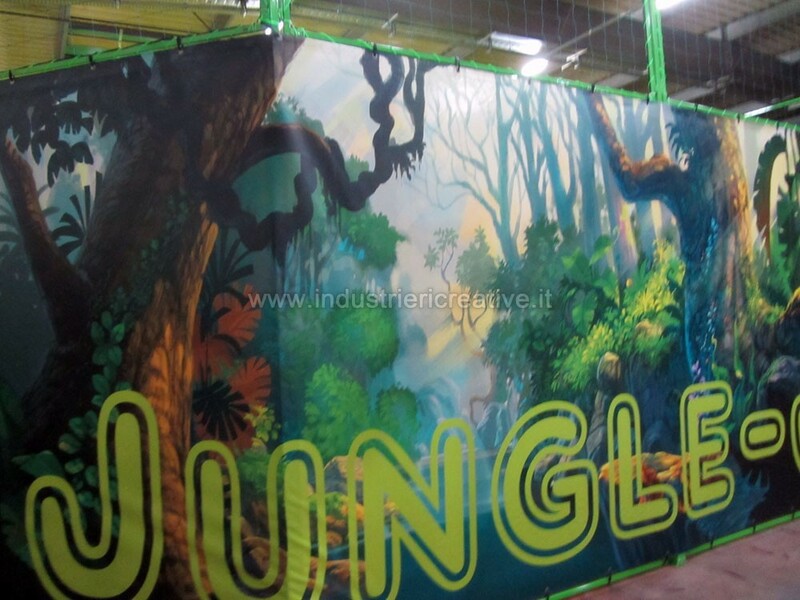 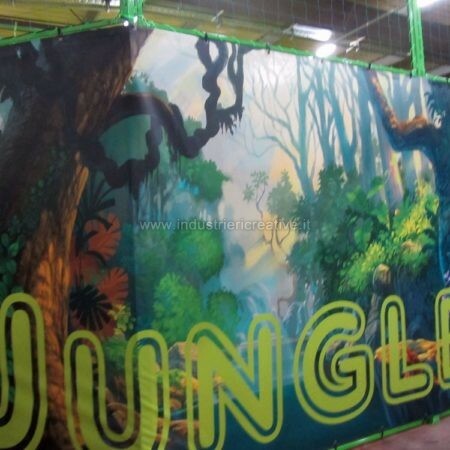 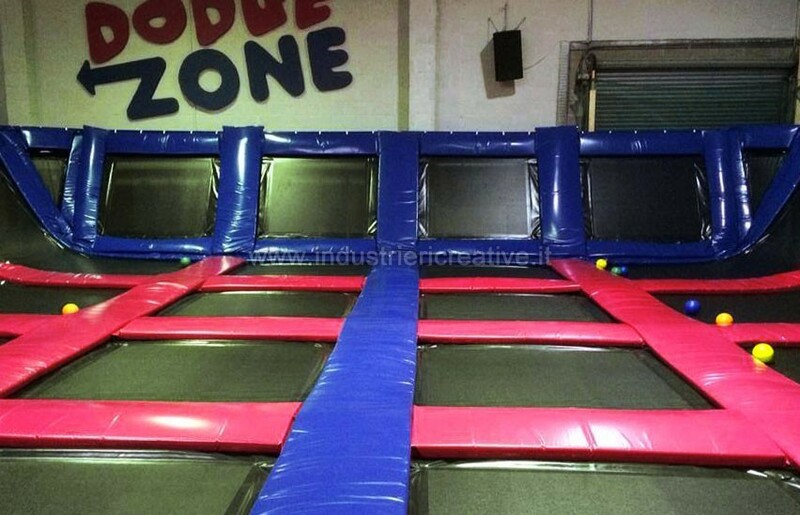 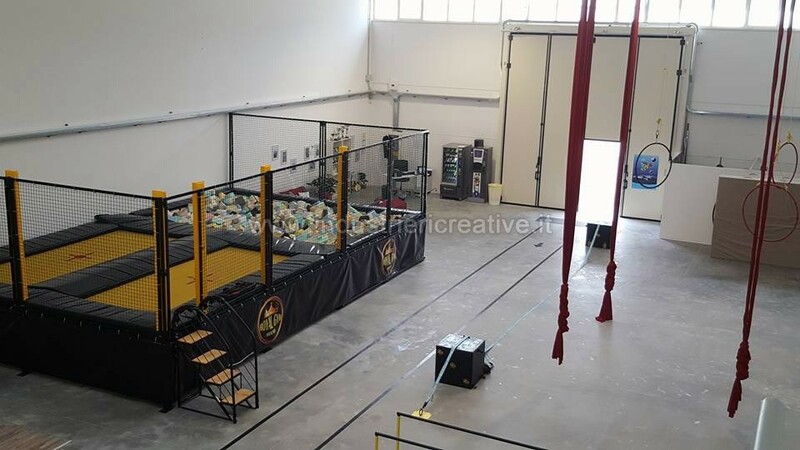 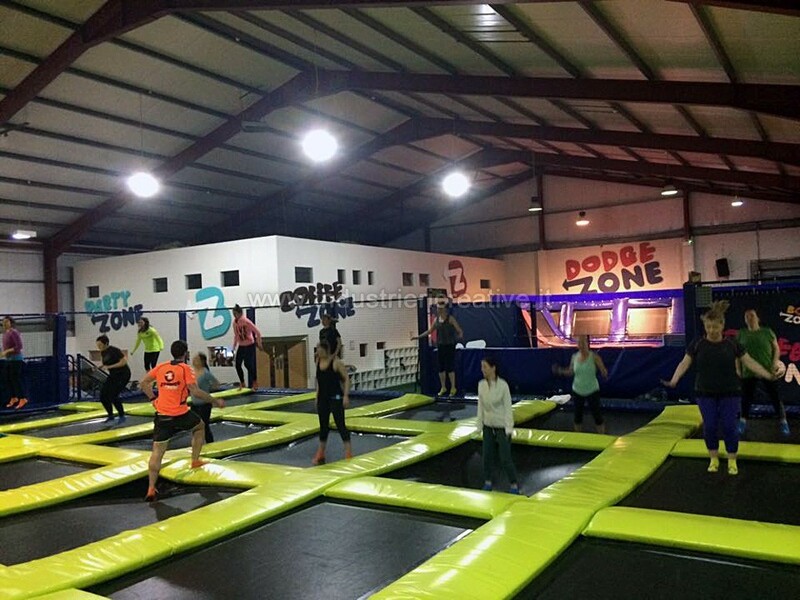 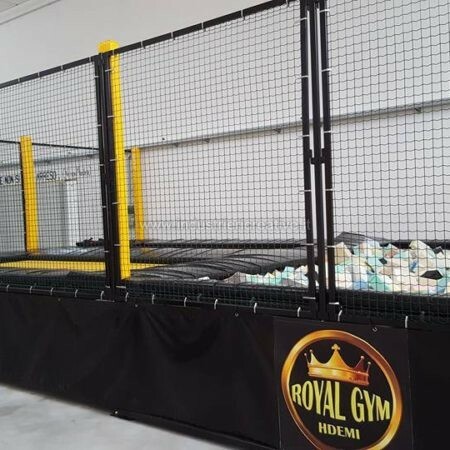 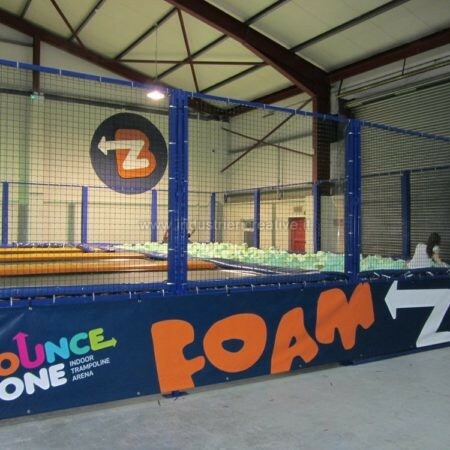 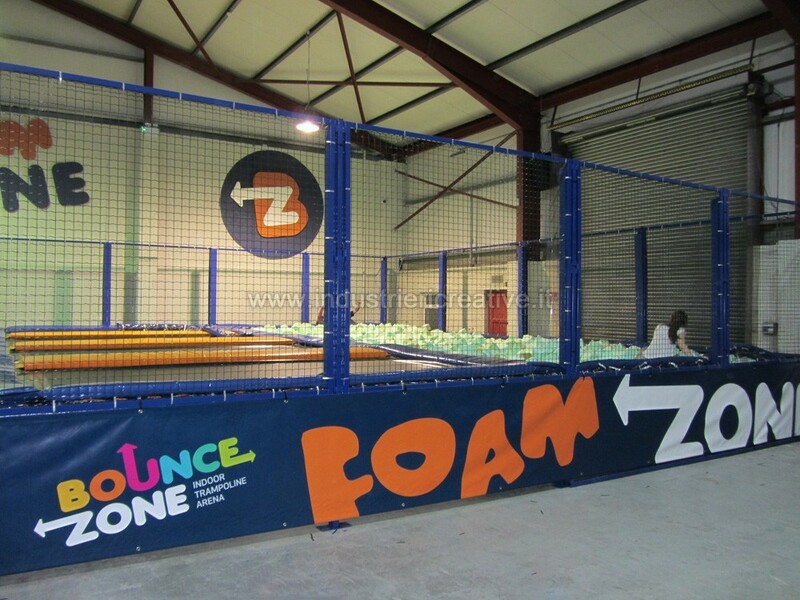 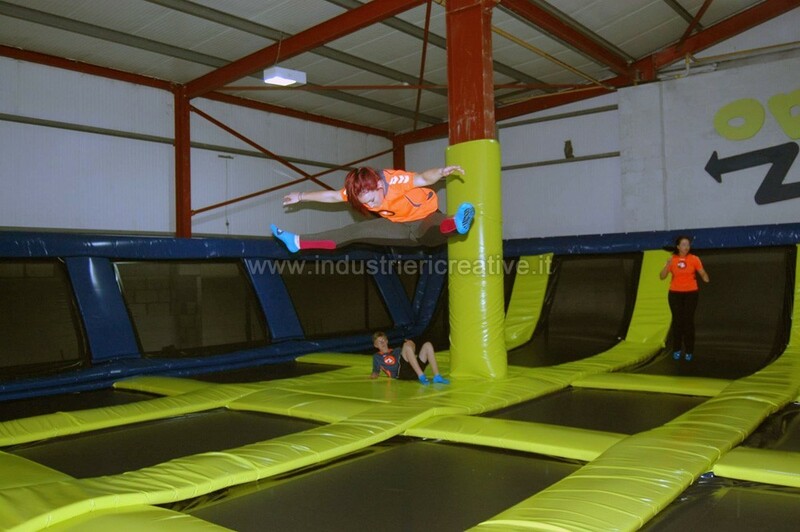 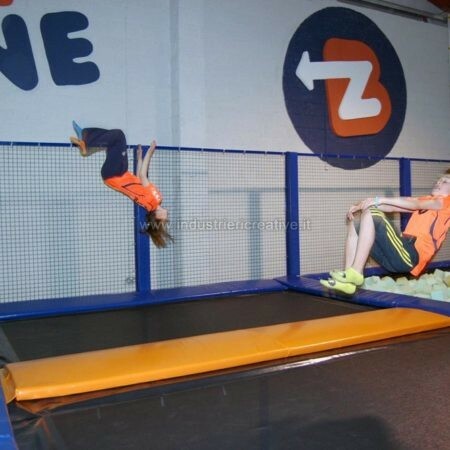 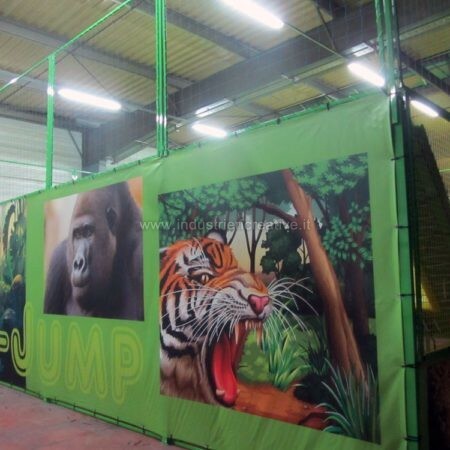 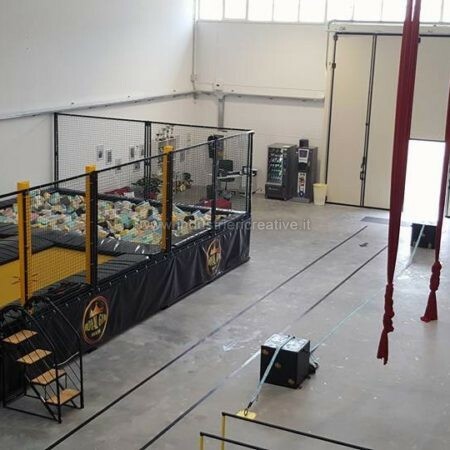 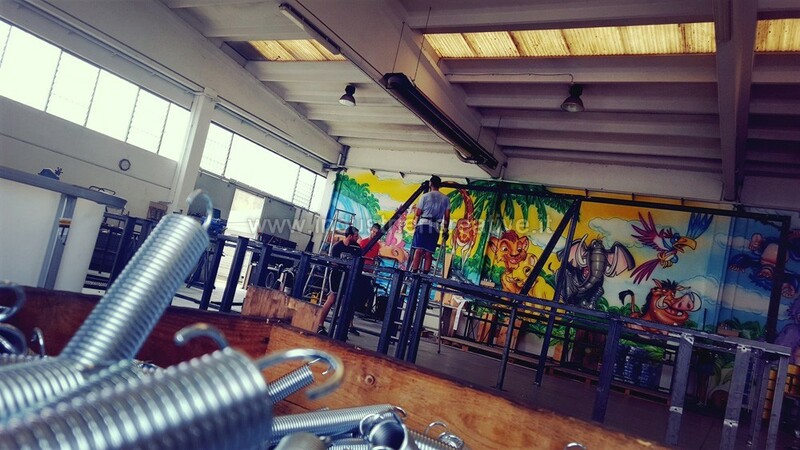 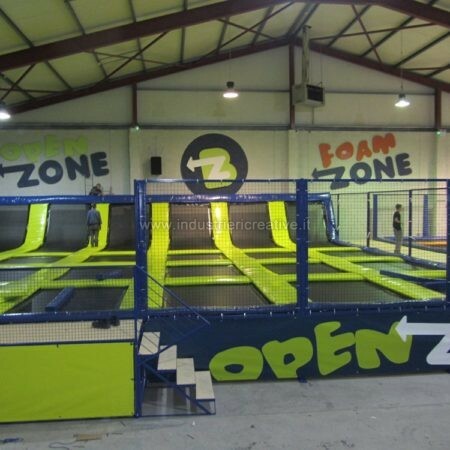 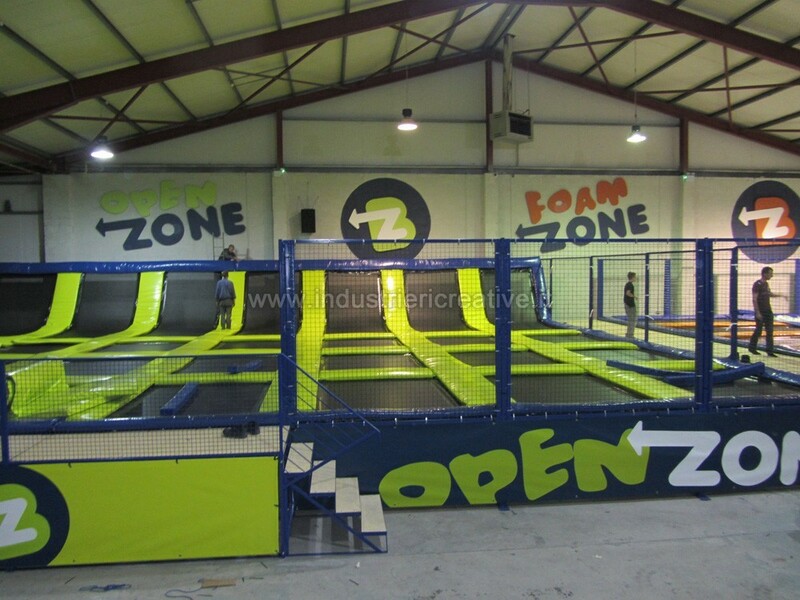 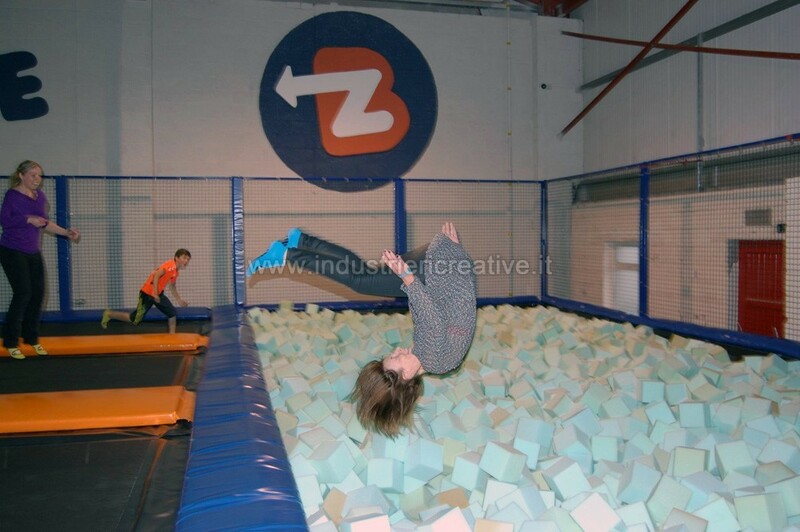 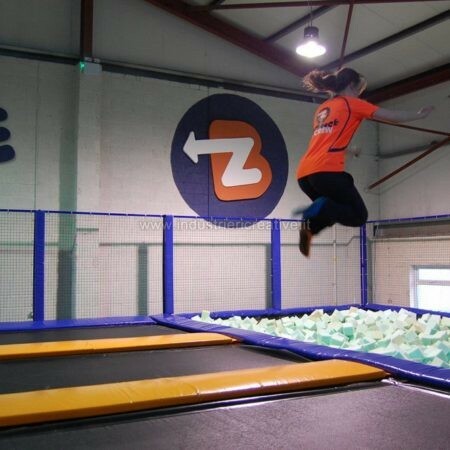 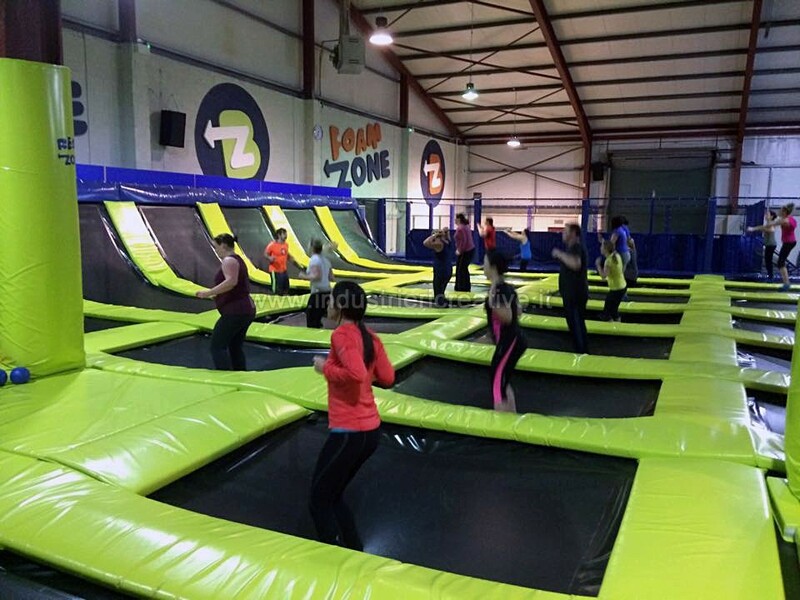 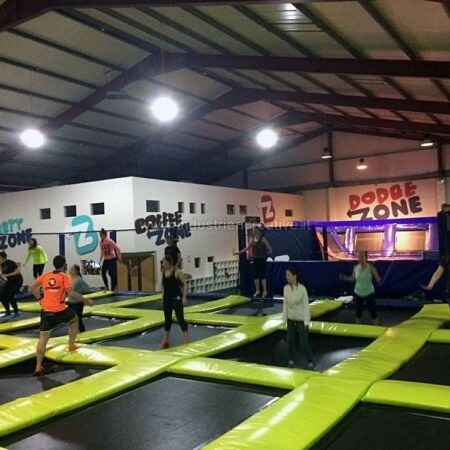 In large spaces, customers can add to the above mentioned Trampoline Park models Towers (from 3.50 to 8.00 meters in height) from which users can jump on a large trampoline, and Climbing walls from which users can drop into the Foam Pit/inflatable Airbag.